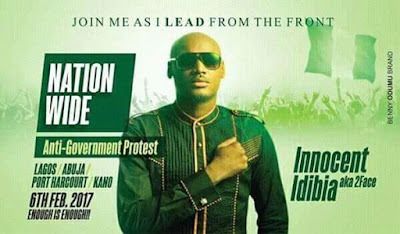 Since popular Nigerian Musician Tuface Idibia Popularly called 2baba by his teeming fans announced his intentions to lead a nationwide protest against the federal government on February 6th, there has been lots of criticisms coming from different quaters. This is however not surprising since this is Nigeria where anything can happen and where lots of people have lost their moral values. It started with a so called professor from the south west, who rather than raise some tangible facts or reasons why he feels the protest should not hold, was busy insulting the personality of 2baba and throwing tantrums at his private life, To me that was very low of the so called professor. I learnt he has since realised his mistake and has apologised! Then came the commissioner of police of lagos state, saying the protest cannot hold because intelligence reports has it that some hoodlums were going to hijack the protest and use the occasion to cause havoc. Now you can begin to wonder what is the primary duty of the police, if the police have discovered the plan by some unscrupulous elements to cause mayhem during the protest, is it not logically simple for the police to be at the occasion of the protest to make sure it's not hijacked and also arrest anyone that tries to cause any form of trouble? That statement by the police chief was not only laughable but brazenly bizarre! I also learnt he has since retracted his statements. There has also been different individuals and NGOs all over the country trying so hard to blackmail Mr Idibia, which to me is very appalling! They have come up with different lame and unconvincing reasons why the protest shouldn't hold. Even going to the extent of politicing the whole issue, naming different politicians as the sponsors of the protest. Personally, i think anybody that is against this protest is definitely not a patriotic Nigerian. Nigeria is going through its worst recession in its history, inflation is at its peak, the prices of commodities keeps increasing everyday. Forex is at its record high of #500 to $1. People are losing their job, innocent Nigerians are killed everyday by fulani herdsmen. Hundreds of Christians has been killed in southern kaduna. Epileptic power supply, prices of kerosene, petrol and diesel has skyrocketed , etc. Yet the federal government seems to be overwhelmed by the situation and there is no respite in sight still. They might not listen to the protesters, but maybe, just maybe a little push will make them sit up and find solutions to the numerous problems plaguing Nigerians. This is not about political party, tribe or religion, because hunger and suffering doesn't care who you are or where you are from. Despite all this anomalies the only good thing the federal government was initially getting right which was "fighting corruption" had come to a standstill since the secretary to the federation was cleared by the presidency from any form of corruption, despite the overwhelming evidence against him in his famous"Grass cutting" saga! I think the federal government has lost the plot and Nigerians don't seem to know the direction the government is going economically and other areas of governance. Maybe the protest might be a futile attempt, maybe after the protest things will remain the same or rather get worse! But Nigerians need to show the government that they are tired and are really suffering. Let all those unpatriotic Nigerians that are against the protest come out and give logical reasons why the protest shouldn't hold, they should explain to us why the prices of commodities are so high, why people are killed everyday, why salaries are not been paid, why those working with the federal government are all saints, why 1 dollar = 500Naira, why. ....But till then I join million of Nigerians to say ENOUGH IS ENOUGH and #IStandWith2Baba. ..